Elizabeth Warren is returning to late night, everyone! Not permanently, obviously — although a late-night talk show hosted by Elizabeth Warren would be worth any ticket price, especially if she somehow convinced Bernie Sanders to be her band leader. Rather, I'm talking about her returning to the late-night scene as a guest, which she'll be doing Wednesday on CBS' The Late Show. She'll be sitting down with Stephen Colbert to chat about, well, wherever the conversation goes. It might be instructive to revisit her last such TV appearance. Here's a look back at Elizabeth Warren's last late-night interview, with NBC's Seth Meyers late last year. When Meyers interviewed Warren, she was still the source of widespread rumors about 2016 — will she run for president or won't she? It never seemed to matter much that she was open about not wanting to, as the political scuttlebutt took on a life of its own. 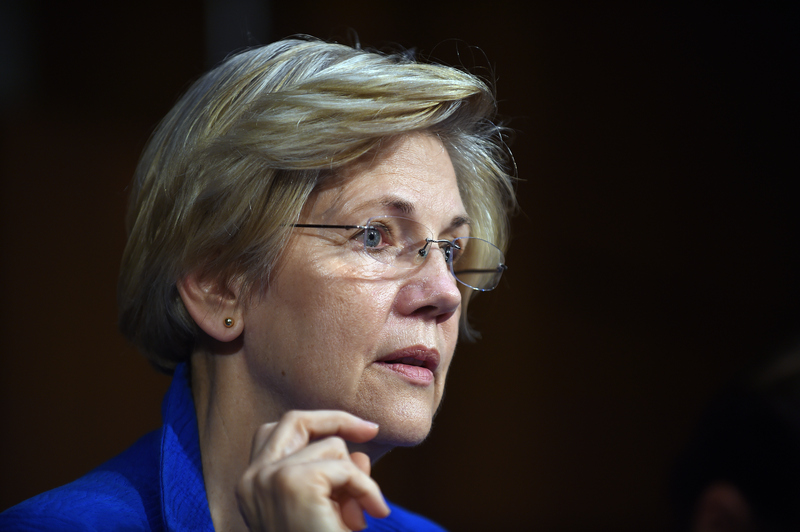 But when Warren appeared on Late Night in November 2014, she was in a very different position than she is now. Four random letters. It was named by the Republicans ... Do you know, the truth is, I've never said this publicly — yes, I actually do think [the Republicans] gave it a bad name. We had better names out there. So I just call it the Consumer Agency, that works. You may not remember the initials, but here's what I do want you to remember: It's that this little agency has been up and running for a little over three years now, and the bottom line with this agency is just to level the playing field a little bit. To say that big banks don't get to trick you on credit cards, and big financial institutions don't get to cheat people on mortgages and payday loans. And so far, this little agency has force the biggest financial institutions in this country to return more than four billion dollars to families they cheated. That's government that works. This brought some understandable applause from the crowd, and frankly, it would've sounded just as great coming in a presidential stump speech as it did on Meyers' show. Warren has long been a champion for progressive issues — those relating to financial regulation and consumer protection in particular — and she was at one time viewed as a major threat to Hillary Clinton's 2016 prospects. She always gave the same answer to queries about a possible run, however: a firm no. In fact, months after her appearance with Meyers, he roasted the media for refusing to take her word for it. Basically, if history is any guide, you can expect to hear Warren and Colbert covering some of this same territory, because it's virtually her signature issue. Consumer protection is the entire reason she's a senator in the first place. And Colbert's covered such issues before, albeit from beneath the cover of his satirical conservative persona on The Colbert Report. It's also true that ideas ike Warren's are enjoying something of a springtime in the Democratic Party right now. Bernie Sanders, perhaps the most vociferous voice around for income equality and anti-corporatism, was very well-received by Colbert's audience last week.